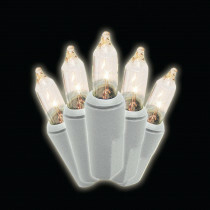 This box contains 2 sets of 100-Count mini clear lights on white wire. Each light strand is 22.4 ft. long, including an 18 in. lead cord, 2.5 in. spacing and a 3.5 in. end cord. If one bulb goes out, the others will stay lit on this set. Each string has an end to end connector to add on light sets for any sized decorating project.